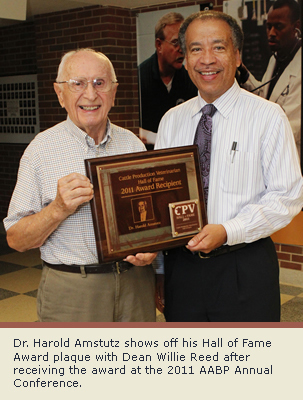 The Purdue Veterinary Medicine Family lost one of the College of Veterinary Medicine’s founding faculty members with the passing of Professor Emeritus of Veterinary Clinical Sciences Harold Amstutz June 11. He was 93. Dr. Amstutz joined the faculty as head of the Department of Veterinary Clinics in 1961, just two years after the first class of veterinary students enrolled in what was then the Purdue School of Veterinary Science and Medicine. He remained on the faculty until he retired in 1989. A 1945 DVM graduate of Ohio State University, Dr. Amstutz was a charter diplomate of the American College of Veterinary Internal Medicine and became renowned for his expertise on bovine diseases. Sought-after as a lecturer and consultant, Dr. Amstutz was elected as the first executive vice president of the American Association of Bovine Practitioners (AABP) in 1989. He received numerous awards, and in 2011, he became one of two inaugural inductees into the Cattle Production Veterinarian Hall of Fame at the AABP’s annual conference. 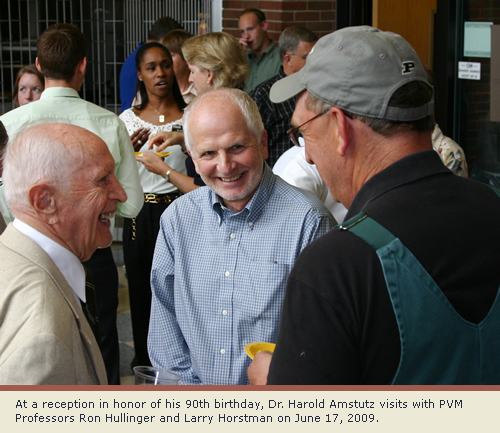 Even after retiring as a Purdue faculty member, Dr. Amstutz remained very active in the life of the College, serving on the Admissions Committee, leading the committee that commissioned the Continuum Sculpture, and attending numerous Honors and Awards Banquets to present the Amstutz Bovine Award for high interest and proficiency in bovine medicine and surgery. In lieu of flowers, the family asked that contributions be made to Our Saviour Lutheran Church, 300 W. Fowler Avenue, West Lafayette, IN 47906, or the AAPB’s Amstutz Student Scholarship Fund, PO Box 3610, Auburn Alabama 36832. A Celebration of Life Service was held for Dr. Amstutz July 20 at Our Saviour Lutheran Church. To view the complete obituary in the Lafayette Journal and Courier, click here. To view an obituary posted on the AABP website, click here.